At some point between 2006 and 2008, the American people decided to turn their backs on the world. Between the seeming futility of the war in Iraq and the financial collapse of 2008, Americans decided they’d had enough of the world. In Barack Obama, they found a leader who could channel their frustration. Obama’s foreign policy, based on denying the existence of radical Islam and projecting the responsibility for Islamic aggression on the US and its allies suited their mood just fine. If America is responsible, then America can walk away. Once it is gone, so the thinking has gone, the Muslims will forget their anger and leave America alone. As a consequence, for the first time in a decade, Americans are beginning to think seriously about foreign policy. But are they too late? Can the next president repair the damage Obama has caused? The Democrats give no cause for optimism. Led by former secretary of state Hillary Clinton, the Democratic presidential hopefuls stubbornly insist that there is nothing wrong with Obama’s foreign policy. If they are elected to succeed him, they pledge to follow in his footsteps. Republican presidential hopefuls are united in their rejection of Obama’s policy of ignoring the Islamic supremacist nature of the enemy. All reject the failed assumptions of Obama’s foreign policy. All have pledged to abandon them on their first day in office. Yet for all their unity in rejecting Obama’s positions, Republicans are deeply divided over what alternative foreign policy they would adopt. The importance of the dispute cannot be overstated. Given the Democrats’ allegiance to Obama’s disastrous policies, the only hope for a restoration of American leadership is that a Republican wins the next election. But if Republicans nominate a candidate who fails to reconcile with the realities of the world as it is, then the chance for a reassertion of American leadership will diminish significantly. Tuesday, the International Atomic Energy Agency voted to close its investigation of Iran’s nuclear program. As far as the UN’s nuclear watchdog is concerned, Iran is good to go. The IAEA acknowledges that Iran continued to advance its illicit military nuclear program at least until 2009. Tehran refuses to divulge its nuclear activities to IAEA investigators as it is required to do under binding UN Security Council resolutions. Iran refuses to allow IAEA inspectors access to its illicit nuclear sites. As a consequence, the IAEA lacks a clear understanding of what Iran’s nuclear status is today and therefore has no capacity to prevent it from maintaining or expanding its nuclear capabilities. This means that the inspection regime Iran supposedly accepted under Obama’s nuclear deal is worthless. The IAEA also accepts that since Iran concluded its nuclear accord with the world powers, it has conducted two tests of ballistic missiles capable of carrying nuclear weapons despite the fact that it is barred from doing so under binding Security Council resolutions. Certainly the Obama administration doesn’t. The sighs of relief emanating from the White House and the State Department after the IAEA decision were audible from Jerusalem to Tehran. The IAEA’s decision has two direct consequences. First, as Iranian President Hasan Rouhani said Wednesday, it paves the way for the cancellation of the UN’s economic sanctions against Iran within the month. Hours after the IAEA vote, Turkey and Qatar announced that Turkey is setting up a permanent military base in the Persian Gulf emirate for the first time since the fall of the Ottoman Empire a century ago. Their announcement indicates that the informal partnership between Turkey and Qatar on the one side, and Hamas, Muslim Brotherhood and Islamic State on the other hand, which first came to the fore last year during Operation Protective Edge, is now becoming a more formal alliance. During Operation Protective Edge, the administration supported this jihadist alliance against the Israeli-Egyptian partnership. Throughout Hamas’s war against Israel, Obama demanded that Israel and Egypt accept Hamas’s ceasefire terms, as they were presented by Turkey and Qatar. Since Operation Protective Edge, the Americans have continued to insist that Israel and Egypt bow to Hamas’s demands and open Gaza’s international borders. The Americans have kept up their pressure on Israel and Egypt despite Hamas’s open alliance with IS in the Sinai Peninsula. So too, the Americans have kept Egyptian President Abdel Fattah el-Sisi at arm’s length, and continue to insist that the Muslim Brotherhood is a legitimate political force despite Sisi’s war against IS. Washington continues to embrace Qatar as a “moderate” force despite the emirate’s open support for the Muslim Brotherhood, Hamas and IS. As for Turkey, it appears there is nothing Ankara can do that will dispel the US notion that it is a credible partner in the war on terror. Since 2011, Turkey has served as Hamas’s chief state sponsor, and IS’s chief sponsor. It is waging war against the Kurds – the US’s strongest ally in its campaign against IS. In other words, with the US’s blessing, the forces of both Shiite and Sunni jihad are on the march. And the next president will have no grace period for repairing the damage. Although the Republican debate Wednesday night was focused mainly on the war in Syria, its significance is far greater than one specific battlefield. And while there were nine candidates on the stage, there were only two participants in this critical discussion. 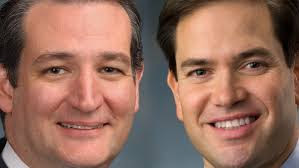 Senators Marco Rubio and Ted Cruz faced off after weeks of rising contention between their campaigns. In so doing, they brought the dispute that has been seething through their party since the Bush presidency into the open. Rubio argued that in Syria, the US needs to both defeat IS and overthrow Syrian President Bashar Assad. Cruz countered that the US should ignore Assad and concentrate on utterly destroying IS. America’s national interest, he said, is not advanced by overthrowing Assad, because in all likelihood, Assad will be replaced by IS. If Rubio is the heir to Bush, Cruz is the spokesman for Bush’s until now silent opposition. In their long held view, democratization is not a proper aim of American foreign policy. Defeating America’s enemies is the proper aim of American foreign policy. Rubio’s people claim that carpet bombing IS is not a strategy. They are right. There are parts missing from in Cruz’s position on Syria. But whatever happens, the fact that after their seven year vacation, the Americans are returning the real world is a cause for cautious celebration.